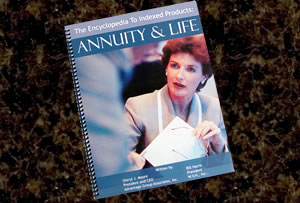 Moore Market Intelligence’s founder has authored several books relating to indexed annuities and indexed life insurance products. For those looking for more than a snippet on these rapidly-growing lines of business, these manuscripts are a great place to start. Always offering a third-party perspective, and never endorsing any company or product, Sheryl J. Moore delivers a message that simplifies even the most complex products in a manner that any beginner can understand. There is no better way to educate yourself on indexed life and indexed annuities than by learning from two of the most accredited experts in the insurance marketplace. Sheryl J. Moore is the foremost authority in the indexed life market. Bill Harris, President of W.V.H., Inc. has had four decades of annuity success. This book is a comprehensive, easy-to-read course that qualifies for more than one state’s continuing education (CE) requirements. Please Contact Us for details or purchases.